How would only being able to speak in song lyrics handicap you on the dating scene? That’s the question posed in ‘Vevo Lyric Lines’, a series of bittersweet short films from Vevo UK, in partnership with the all-new Toyota Aygo. 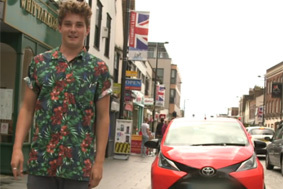 Across eight rib-tickling episodes, 21-year-old presenter Flynn Horne attempts to find the perfect partner in different UK cities, aided by an Orange Twist Toyota Aygo x-cite. Watch this episode, in which Flynn travels to the upmarket town of Brentwood in Essex – home of phenomenally successful reality show ‘The Only way is Essex’ – and uses lyrics from the songs of Kasabian to impress the ladies. All eight episodes of Lyric Lines are now available to watch on YouTube. Further information about the Toyota Aygo range is available on the designated section of the Toyota UK website. Fancy a test drive? Leave a comment below and we’ll be in touch shortly. Fancy seeing the Iceland volcano in a Toyota Hilux?